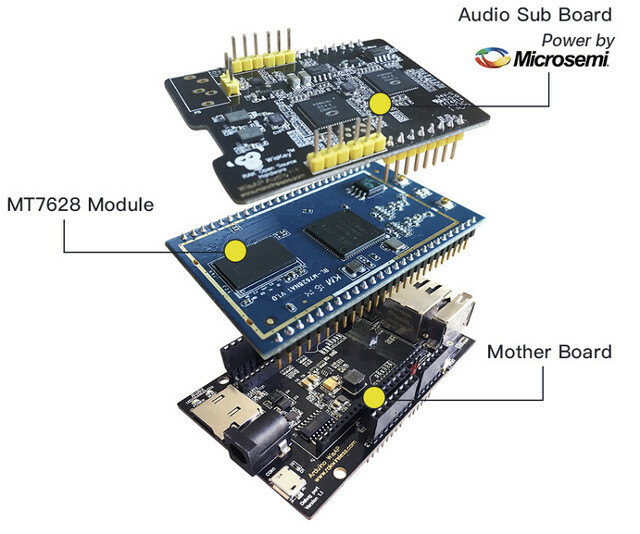 RAK Wireless has launched a new development board powered by Mediatek MT7628A processor running OpenWrt with built-in WiFi and Ethernet connectivity, and audio codec and microphone to support Amazon Alexa voice service. 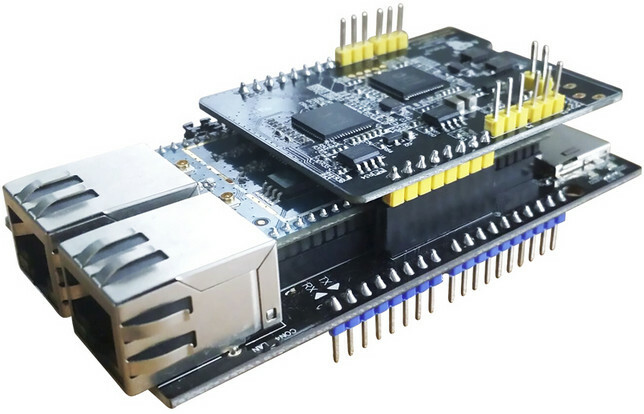 Bluetooth, Zigbee, and Z-wave will also be supported via UART modules. As you can see from the photo below, the main components are on separate boards (for some reasons) with a “mother board”, MT7628 module, and an audio sub-board. 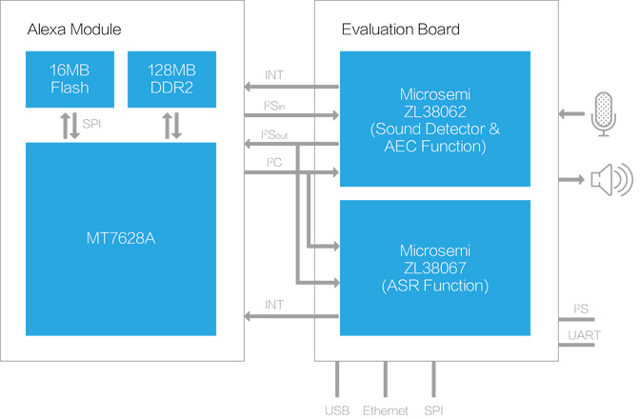 As mentioned in the introduction, the MT7628 module runs an OS based on OpenWrt with RAK iGate middleware, and the company provides an SDK allowing you to develop solutions based on Amazon Alexa thanks to one codec that will detect “Alexa” keyword and wake up to the board, and another codec handling audio capture and output. 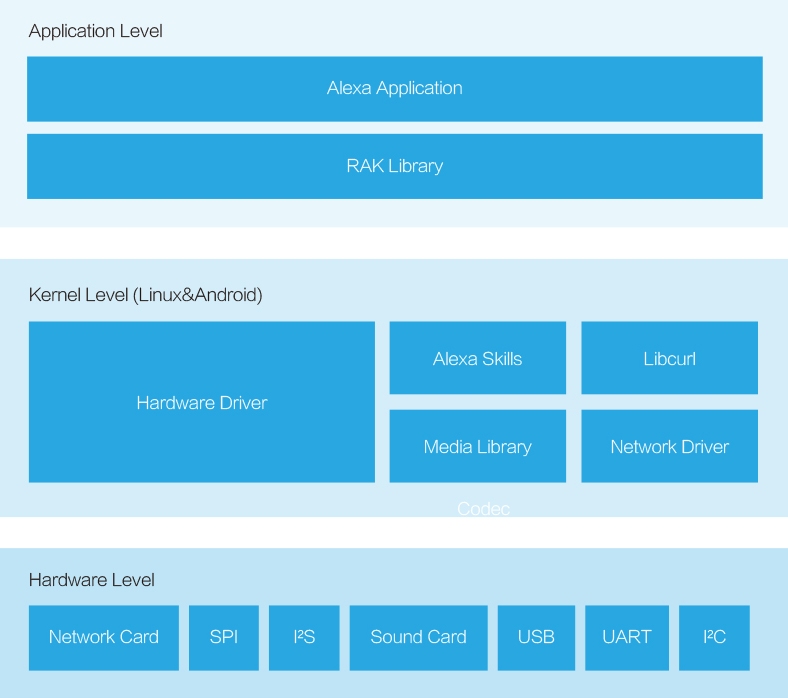 The software architecture is shown below, Wiscore app for Android and iOS is provided to pair the EVK with Alexa, and more documentation and software can be found in the Wiki on Github. The solution can be used to build voice controlled home automation gateways or appliances, smart speakers, and robots. RAK Wireless sells a development kit with the three boards, an Ethernet cable, a speaker, a USB cable, two antennas, some Dupont wires, some jumpers, and a Quick Start Guide for $49 plus shipping. Visit the product page for a few more details. Voice “services” is another area where open source really needs to step up its game. You can not have “free” software if you depend on Cloud functionality, EULAs, ToS, and monthly fees for your core services. When your internet is down, you own a brick. Also of interest is the MIPS core. MIPS is up for sale again. Who knows what direction its next owner will take it or if there will even be a next owner. Of course, these concerns are of far less importance in “modern” times. Products today have a life span slightly longer than toast left in the rain. 30 years ago a diagram circulated to build a voice recognition circuit for robots using an intel 8748 microcontroller recognizing 10 words, which I eventually built. This was with 64B RAM, 1kB EPROM, and 11 MHz / 15 cycles ~= 0.7 MIPS. The analog signal was cut into low and high frequencies by an LM324 and decoded by the uC. If it was possible to do all this with so little resource, you can imagine what can be done off-line with a 1000 times faster CPU, with 2000 times more RAM and 16000 times more storage, surrounded by specialized ASR devices. If this board takes off, I wouldn’t be surprized if some people manage to make it 100% autonomous for single-word actions, which usually is enough for remote control in kitchens or anywhere your hands are not free. The most difficult with speech recognition in opensource environments is that everything has to be done from scratch for each language while opensource consists in joining efforts from various places, not requiring the same skills to be replicated everywhere. It would work much better if we in fact invented a common language with easily pronounceable words for such applications. That’s more or less what Amazon did with their “Alexa” prefix and Google with “OK Google”. Or maybe we should use Esperanto ?